Keeping patients informed is important to us. Dr E is an assistant professor at UT, which helps him stay up-to-date with current information. Please take a moment to read the following answers to some of the questions we are asked most often. Hopefully, we will cover some of your own dental concerns and give you insight into our practice and procedures. If you don't find the information you're looking for, please feel free to contact our Sugar Land dental office. Q: How does the doctor keep up-to-date on all of the current techniques and materials? A: Dr. Ebrahimian subscribes to numerous industry journals to stay on top of the latest advances in dentistry. He regularly participates in continuing education, and makes sure that his staff does the same. We believe it is our responsibility to stay up to date with current techniques and materials that can maximize the comfort and quality of our patients' dental care. Q: Can you show me what my smile can look like ahead of time with imaging software? A: Yes. Every individual has a unique "perfect" smile that fits your face. We can show you what your ideal smile can look like. We routinely use dental imaging to help our patients quickly and easily visualize the end results of cosmetic and restorative work. It's just a matter of asking some questions, taking photos of your current smile, and entering the right information into the computer. You will get to see a graphic image that gives you an accurate "picture" of exactly how your procedure will affect your smile. A: If you have a dental emergency, please contact our Sugar Land office voice mail and describe your condition in detail. We will return your call as soon as possible, give you helpful information over the phone, and then determine if you need to be seen immediately. A: Don't panic! Reassure your child that this happens to lots of kids and that you can help. First, place the tooth in milk or try to keep it in your child's mouth. Then, contact us immediately to see Dr. Ebrahimian as soon as possible. Simply describe the situation over the phone and our office staff will help you determine the safest and most appropriate plan of action. If it's a baby tooth, you don't need to worry about saving it, but you do want to consult your dentist right away to check for damage. Also, your child may need a space maintainer if the permanent tooth is years away from coming in. If the tooth that gets knocked out is permanent, you do want to take act quickly to try to save the tooth. You need to get the child to the dentist quickly. If you act fast and take the recommended steps, there's a good chance that knocked-out tooth can be saved. Whether a baby tooth or permanent one is lost, Dr. Ebrahimian's staff will carefully explain exactly what you need to do. We are always there to help you through any emergency with experience, expertise, and empathy. A: There are a number of ways to help whiten your smile, from at-home whitening products to in-office supervised treatments (Zoom! Whitening is available at our office). Dr. Ebrahimian can help evaluate the potential for whitening your teeth, based on their current color and the causes of any discoloration, and help you decide on the best, most cost-effective approach for you. Q: What makes you different than any other dental practice I can visit? A: We hear time and time again from our patients that they feel like family at Premier Dental. We do everything we can to create a relaxing atmosphere. Dr. Ebrahimian is known for his gentle, reassuring style as well as his expertise, which is why so many patients stay with our practice even after they move miles away. We also encourage an honest, direct dialogue with our patients. Dr. Ebrahimian makes calls every evening to patients who have had work done that day to make sure they are doing well. 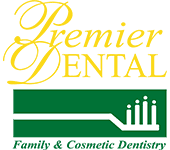 At Premier Dental, we see every patient as a person first, and we offer the time, care, and attention every individual deserves. A: Bleeding gums can have any number of causes, including improper, rough, 'scrubbing' instead of gentle, circular brushing motions; using a hard-bristled tooth brush instead of a soft one; plaque and/or tartar build-up below the gum line; or gum sensitivity due to gum disease. If this problem persists despite correct brushing and flossing techniques, or occurs every time you brush, contact our Sugar Land dental office to set up an evaluation. Q: Crowns, veneers, onlays, inlays and partials -- where can I learn more about these procedures? A: You can find more in-depth information about each of these treatments by visiting the American Dental Association. Below is a brief description of each: Crowns: designed to fit snugly and function as normal teeth, crowns are used on cracked, broken, decayed, or worn teeth and are designed to protect those teeth from further damage as well as preserve your jaw's correct natural alignment. Porcelain Veneers: These are thin sheets of ceramic that bond directly to the front surfaces of teeth. They are highly resistant to coffee, tea or other staining agents and mostly closely resemble healthy, white tooth enamel. Onlays and Inlays: Onlays and inlays are strong, attractive, and safe alternatives to metal fillings. Onlays are used for large restorations. They restore the area inside the cusp and extend over one or more sides of the tooth. Because of their size they are usually made of porcelain. Inlays are used to restore the area of tooth inside the cusps. Inlays are a conservative tooth restoration which means they require far less drilling and preparation of the tooth than a metal filling. Inlays are usually made of porcelain or composite resin, making them "invisible" in your smile. Partials: Removable partial dentures usually consist of replacement teeth attached to pink or gum-colored plastic bases that are connected by metal framework. Partial dentures attach to your natural teeth with metal clasps or devices called precision attachments. Precision attachments are generally more esthetic than metal clasps and they are nearly invisible. A: Bad breath, or halitosis, is reported to affect over half the population, yet too few seek dental attention for the condition. The fact is bad breath is treatable! First, you want to make sure you are practicing proper and consistent hygiene. That means daily brushing, daily flossing, use of mouthwash and tongue cleaning; regular professional cleanings; and careful cleaning of any dentures or removable dental appliances. However, if your hygiene is perfect and your breath still is not, we can provide several solutions, including BreathRx and Oxyfresh. You may need a thorough dental cleaning as well. The first step is to call our dental office in Sugar Land for an evaluation; from there we can help you banish bad breath for good. A: You'll be glad to know that there are several options available today to improve the look of your front teeth without the use of braces. And Dr. Ebrahimian is extremely knowledgeable and proficient in all of them. Sometimes it just takes a little reshaping and adding porcelain veneers to achieve the desired look. In other cases, it may be necessary to attach "invisible" braces behind the front teeth. We would be glad to talk with you further about the option that best suits your individual situation.